This is one of our first dual concept fragrances. 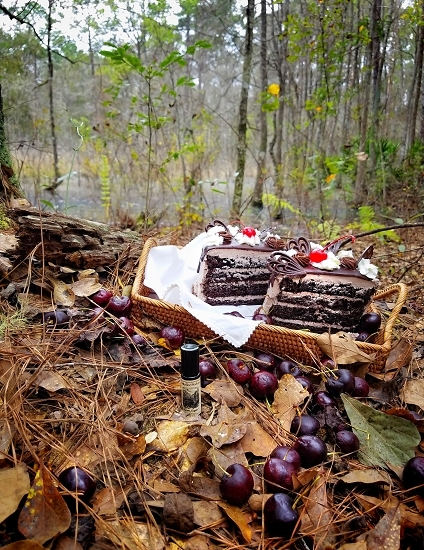 It is meant to embody the luxurious decadence of black forest cake and the dark secluded imagery of the Black Forest in Germany. The focus was on rich exotic wood notes in lieu of conifer notes to represent the forest. Black Forest is very heavy on the woods. On initial application the cherries are detectable but they quickly fall into a chasm of deep dark notes that serve to tame the gourmand element of this blend. The agarwood and nagarmotha prop up the sweet notes and are the next to be discovered. Nagarmotha essential oil is a divine cross that strikes somewhere between vetiver and agarwood. It evokes a rare and precious wood note. The tobacco and hay absolutes are the next notes to emerge quickly after detection of the aforementioned notes. They wrap the other oils in a cozy, warm, dry and dusty blanket. This is the point where Black Forest turns most dry and smells like a humidor housing a very fine and exceedingly dark chocolate cherry pipe tobacco. The scent stays in this phase for a little while but as your skin warms it, the ethereal billows of the fluffiest whipped cream waft far in the background and sweeten the blend of woods to the point that it begins to smell like a wonderful unlit incense stick coupled with the pipe tobacco. The gourmand notes end up receding tremendously though they are invaluable to the overall character of this scent. This is not a standard foodie scent. If you like dark fragrances with these notes, try this unusual and enticing fragrance. It is full of character and depth. After a few hours on the skin it turns a lot sweeter when the whipped cream note is most apparent but the woods keep it grounded and it stays a super delicious incensey scent. 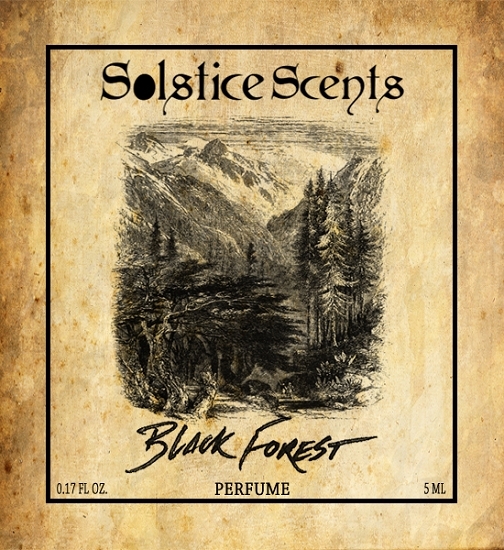 For independent reviews of this fragrance, please visit the Black Forest Perfume thread on the Solstice Scents Forum by clicking HERE.